On April 16, the intrepid reporter, successful editor, renowned tech columnist and author will share her extensive knowledge on the convergence of the media and tech industries, as a keynote speaker at the 17th International Symposium on Online Journalism (ISOJ). According to the New York Magazine story, Swisher’s success is backed by her many years of experience in the field, the digital journalism ventures and conferences she’s co-founded, a dogged reporting ethic and ability to break big stories. ISOJ is a global conference organized by the Knight Center for Journalism in the Americas that attracts media executives, journalists and scholars from around the world to discuss the latest trends and challenges in online journalism. Registration is now closed, but live streaming of the event in English and Spanish will be available. After starting out at The Washington Post, Swisher joined The Wall Street Journal in 1997 as a reporter on technology issues and wrote the column “BoomTown” from and about the growing technology scene in Silicon Valley. 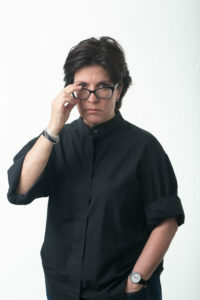 In 2003, she and fellow tech columnist Walt Mossberg started the D: All Things Digital tech conference. Four years later, they launched AllThingsD.com, an online site covering news in technology that was owned by Dow Jones. The pair, who worked as co-executive editors, allowed their license with the media company to expire in 2013. A year later, they launched tech news site Re/code, a must-read for followers of tech business in the United States. Re/code was purchased in 2015 by Vox Media, whose CEO Jim Bankoff was a keynote speaker at ISOJ in 2014. Swisher also authored the books “aol.com: How Steve Case Beat Bill Gates, Nailed the Netheads and Made Millions in the War for the Web” (1998) and the sequel “There Must Be A Pony in Here Somewhere: The AOL Time Warner Debacle and the Quest for a Digital Future” (2003). Currently, Swisher serves as executive editor of the Re/code, hosts the podcast Re/code Decode and cohosts the Too Embarrassed to Ask podcast with Lauren Goode of The Verge. She and Mossberg also organize the Code Conference for leaders in the tech industry. As someone who has launched two successful digital journalism sites, Swisher has valuable insight into the challenges and triumphs of starting and maintaining entrepreneurial journalism ventures. In addition to Swisher, Cuban journalist Yoani Sánchez, founder of digital news site 14ymedio, and Kinsey Wilson, editor for innovation and strategy and executive vice president of product and technology at The New York Times, are also delivering keynote speeches at the conference. A group of leaders from five nonprofit journalism organizations in the United States also will participate in a keynote panel.